Good morning friends, and welcome to Angelica's Fond Farewell Blog Hop. Angelica Suarez has served as the Design Team/Marketing coordinator for Peachy Keen Stamps, for the past three years, and as many of you may have read from her post here a few days ago, she has made the difficult decision to leave her position at Peachy Keen for a new and exciting job opportunity in the printing industry, which is near and dear to her heart. It's a bittersweet celebration for us, as we are sad to see her go, but we know that she will be a tremendous success in this new venture, and we couldn't be happier for her. It is for this reason that those of us who have been blessed to work with Angelica have come together to bid her a fond farewell and share some special creations that we have made to let her know how much she means to us, how much we have enjoyed working with her, how much we are going to miss her, and that we wish her all the best! We are so happy that you could join us for this special event! 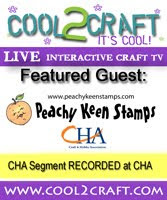 You should have arrived here from the amazingly talented Samantha Casey's Blog, but if you just happened upon this post, then you're going to want to go back to the beginning to The Peachy Keen Stamps Blog so that you don't miss one fabulous creation. I thought and thought about the card I was going to create for Angelica and I had such a mixed bag of emotions about it. On one had, I'm so very happy for her and this opportunity with her career, BUT on the other hand, my first reaction to hearing the news that she'll be leaving Peachy Keen was sad, and by that I mean sad for me, because I'm sure gonna miss her! She has shown tremendous leadership, diplomacy, kindness and grace serving as our DT Coordinator. She has been a wonderful motivator, and she has nurtured and encouraged us both personally and professionally. It has been a wonderful three years, and again... I'm sure gonna miss her!! Here's my card for Angelica using the Misty Sue and Colby Cheer Up stamp set. I colored the image with Copics, and combined patterned paper from my stash with that fancy bling (found at PKS), some Stampin' Up! ribbon, and I even did some faux stitching around the circle. As of Monday, this will be on the way to its intended just to let her know that yes... I'll say it again... I MISS YOU!!!! Now, as long as you're hopping along with us today, I hope you're taking a moment to leave comments for our designers, BECAUSE four of our designers, but we don't know which four, will be giving away a $20 Gift Certificate to Peachy Keen Stamps. You'll increase your chance of winning if you make sure you comment on each blog, and please be sure to leave a comment for Angelica and wish her well on the PKS Blog. Winners will be randomly chosen and announced on the PKS Blog on Tuesday evening. Thank you so very much for stopping by today! I'm the last stop on this hop, and I hope you've enjoyed the creations from the heart that you've seen. Below, please find the complete hop order, just in case you missed a stop, OR in case you'd like to go back and check it all out again. In closing, I'd like to send Angelica a sincere congratulations and best wishes as she makes this exciting career change. It won't be the same around here without you, but I look forward to keeping up with your creative endeavors at Market Street Stamps, and I want to say THANKS FOR EVERYTHING, and if you haven't heard it by now... I'm gonna miss ya!! Okay can you miss me so I can get a card like this one?? LOL This card is not a card, its a piece of art and I am sure she will love it. Amazing job and the stamp is just perfect for it! Thank you so much for putting this all together. You did a great job. Awww...how adorable. Love your card! wow!! beautiful! Your copic skills are PERFECT! Sooo pretty love all the extra details. The pretty bling and the cute card. Great job. Farewell and good luck Angelica! Wow!! Now that's a card! Great coloring and love all the detail. A perfect farewell. WOW!!! This looks amazing. Your coloring is seriously mind blowing. Wow as always your coloring and the way you put a card together are AMAZING!!! awwww.... so sad!that mouse is adorable!!!! super cute card! WOW!!! It's stunning!! I love the bling, it's all just gorgeous!! Great coloring. I learn so much for talented gals like you. Lorie I took one look at your card and wanted to cry and its beautiful she will cherish this card and all the other cards the hop has for her. I am sure she has a lot of emotions going on inside of her and one look at that card will make her day!!! But its not like we will never here from her again cause look where she is leaving from and your parent/bosses will always be there!! Love this card. Such a sad little mouse. Also love all the bling. Such a sad but very adorable little mouse. The bling is gorgeous! And, the color on the mouse is fabulous. Awww....poor little mousie! Your card is just adorable and so pretty all at once! As usual this creation is beyond amazing!! Awwwwww she gonna love it. Great colors on this card. amazing card and amazing coloring. i love the way u colored that mouse. stunning! What a great card. Love the details! Wow!! Your coloring is like a whole new level!! It seriously looks so furry!! AMAZING!! Wow, this card was worth the wait, saved the best for last! Awesome job coloring the 'lil mouse. I'm sure Angelica will love your card. What a truly lovely tribute to Angelica this blog hop has been. OMG AMAZING!!!! Love this card! Beautiful!!! I just love everything about this card!! The image is super adorable!!! OMG!!! I love your card, is soooo cute and the coloring amazing, thanks for sharing. WOW adorable card!! LOVE the mouse! Congrats and best wishes to Angelica!! WOW! Lorie you always amaze me with your talents! Such a super sweet card! Hugs! Wow! Your card is spectacular! You are very skilled in coloring with copic markers. That's such an adorable card. I love the bling on it. The little mouse is colored beautifully! Wonderful! what a gorgeous card! Love the image and all the bling! Angelica will LOVE this! TFS and all the best for Angelica in her next journey! Aww Lorie, this is so precious! The little mouse is so cute, even though he's sad. All the gems are such a fabulous touch and what you said about Angelica was so touching. I wish her all the best in her new venture! love your colouring and all the bling!! Awe Lorie, you're gonna make me cry!! I cried too thinking about leaving PKS. What a tough decision it was. BUT I think of the blessings that are coming from it. I KNOW you are going to be the very BEST DT coordinator in the world, and I am EXCITED to see the fantastic changes in the next 6 mos for PKS. Very good things are in store and I can't think of anyone else more perfect for the role than YOU! Huge, huge hugs!!! So very cute love the bling. Best of luck Angelica... Enjoy the journey! OMG, the mouse is adorable and true to your sentiment and feelings. the mouse is soooo adorable and your design is fantastic!!!! A beautiful card from a beautiful person TO a beautiful person! Janice hit the nail on the head, the bling DOES remind you of floods of tears. Very appropriate. BUT! My mum always said, there's a bright side to everything and Angelica's climb up that career ladder means that PK have a wonderful and very talented lady to step into her shoes. None other than the Copic Queen herself! Wishing you luck and love in your new role that I'm not the slightest bit jealous of! Ha Ha! WOW...this is amazing. Your coloring is phenomenal. WOWZERS! Cute image, great coloring and gotta love all that BLING! You sure are sending her out with a BANG! Love this! Firstly what a fantastic, heartfelt post Lorie. And also what a beautiful card, perfectly created from the heart. Thank you so much for sharing not only your awesome talent, but a little piece of yourself as well with your post. Absolutely amazing! Thanks for sharing your talent. Lorie...your card is stunning!!!. Your colouring is amazing and I love every single detail on it...the bling, the little ribbon, the papers and that cute drop coming from her eye!!!. WOW!!! but you did good... She might get the hint from this hop. ! very sweet miss you card for Angelica! I love your card. Thanks so much for sharing and for the chance to win a prize. aaawwww...your card is just total sweetness! That little mouse is adorable with the tear falling down! I'm sure this card will be loved and treasured! Lori Your Card Is Super Cute & Your Copic Coloring Is Just Amazing!! OMG, this little mouse is just adorable, he looks so sad and yet so cute, great hop lady's, you gave her a bang going out! What a sweet card! The mouse is just adorable! Congrats on your new job, too, my friend! I'm so excited for you!! !